O Magazine O List Pick. 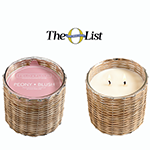 Hillhouse Naturals Peony Blush Handwoven 2 Wick candle was chosen as a May 2017 'O Magazine' O Pick List. Hillhouse Naturals Peony Blush Handwoven 2 Wick candle melds heady rose blooms with jasmine and is rounded out with spicy, rich notes of sandalwood and pink peppercorn. The lush, full and supremely feminine peony is a perennial favorite. Beloved by brides, decorators and gardeners, this gorgeous flower is captured in Field + Fleur Peony Blush. Part of the Hillhouse FIELD+FLEUR Peony Blush Collection.